What are Dr. Stone’s Patients Saying About Him? Dr. Stone, DDS is a cosmetic dentist who specializes in the most advanced technologies in cosmetic dental implants, dental restoration, reconstruction and replacement. Many of Dr. Stone’s patients think he is the best dentist in Ft. Lauderdale. Love Dr. Stone? Leave a Review. ★★★★ If you’re looking for a “real” dentist you found the right place with Dr. Stone. I’ve been a patient for at least 10 or more years. Over those years I’ve seen dentists in different countries when working though out the Caribbean, South America & on the eastern seaboard. Non of then can hold a candle to his expertise. In addition his technicians are number 1. When you get a cleaning it’s a cleaning- the real stuff. Here’s one review that you’ll be happy you read- and I’m sure you’ll pass it on. Never thought that going to the dentist could feel satisfactory until Dr. Stone. If you’re hesitating-don’t. This is the real McCoy. ★★★★★ Had a crown that needed to be replaced. The delicate process necessary was solved with first providing choices and a recommendation for success. The entire experience was beyond my expectations, from the friendly professional staff, Dr Stone’s skilled, gentle mastery. When asked about a dentist, I always speak confidently that Dr Stone’s office is the BEST! ★★★★★ I had a great experience with Dr Stone. New to the area, and no dentist yet, I was not sure where to turn when I chipped an existing crown. After searching on line I found Dr Stone, who had many great reviews. I was able to get in the same week. I found Dr Stone and his staff both warm and professional. Dr Stone listed my options, with no pressure, and buffed the crown so it was smooth while I could take time to decide the best course. ★★★★★ I’ve been coming here for almost 5 years now and have always had a great experience with the staff. Going to the dentist may not be your most favorite thing to do, but everyone here makes it super easy. They explain what they’re doing and why. And they always seem to be looking out for your best interest. I’ve had regular cleanings I can actually say I had a good experience with Dr Stone and Staff, I am very happy I found a nice Dental Office. 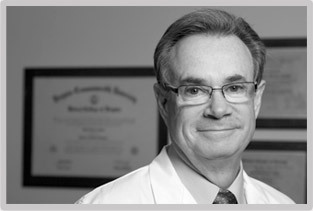 ★★★★★ Dr. Stone is an extremely kind, knowledgeable and honorable Dentist. I have been to many dentists over the past few months hoping to find a reasonable solution to the possible loss of my front tooth. Dr. Stone did not try to sell or push unnecessary treatment plans. He was very focused, caring and explained my options intelligently in a way I could fully understand. He answered all my questions and spent a lot of time with me. I highly recommend Dr. Stone. Thank you!! ★★★★★ I have been seeing Dr. John C. Stone since 2009 and my question to him every time I have an appointment has always been, “Where have you been all my life?” Dr. Stone has proven to be the most knowledgeable, caring, gentle, and kind dentist I’ve come across, with the highest degree of professionalism…believe me, I have been to a lot of dentists. We found out in February that I had an abscessed tooth and had to see an Endodontist for a root canal. Because I had issues with my insurance, I ended up calling Dr. Stone every step of the way to get his advice and guidance. He returned every one of my calls, prescribed me antibiotics and pain killers until my appointment with the Endodontist. I consulted with the Endodontist then went in for root canal treatment. I had a second appointment with the Endodontist but didn’t make it due to the fact that I still was experiencing difficulties with the tooth. Of course I called Dr. Stone again, this time to tell him I want the tooth extracted. Dr. Stone’s ability and trusted that everything would be fine. I left the office knowing that I had done the right thing. Now what made me feel extra special, what put the icing on the cake for me was that today, even though it is the weekend Dr. Stone took the time to call to ensure that I was still doing ok. I expected that I was going to be in excruciating pain after the struggle to get the tooth out and that my face would maybe swell up like a balloon. Nope, didn’t happen! No pain! No abnormal bleeding! No swelling! Oh, and Angie! How can I forget to say thanks a million for your patience and consideration. You are a gem! ★★★★★ From the reception area to Dr. Stone, very professional, caring and compassionate. Having had a bad experience in the past with a previous dentist it was wonderful to go into this office and feel like I mattered. Dr. Stone took the time to explain options that are available to me and really made me feel comfortable. I cannot praise the Doctor and staff enough and have to thank them ALL for putting me at ease. ★★★★★ Judy does a great job of explaining things. I trust her judgement. Angie is always very helpful at the front desk. I am happy to recommend Dr. Stone. He is the best dentist of many I have endured. He is honest, wise, charming, his advice is always thoughtful and right. My implants are wonderful! I live out of state and traveled to Ft Lauderdale on a Friday afternoon before leaving on a cruise the next day.‎ I broke a molar during dinner and needed to see a dentist ASAP. I did an internet search of dentists in Ft Lauderdale, found Dr Stone’s website, called and left a message. Dr. Stone called me right back and was kind enough to come in to the office on a Saturday morning to see me. Thank you very much for seeing me on such short notice. It was very much appreciated. ★★★★★ Dr. Stone and his staff are very professional, friendly, willing to answer all my questions, and genuinely seem to care about getting the best results for the patient. ★★★★★ If you’re looking for a new dentist then look no further. All I can say is that I’ve found my new dentist. Very satisfied with the whole experience. You will be too. ★★★★★ Judy was excellent as usual. 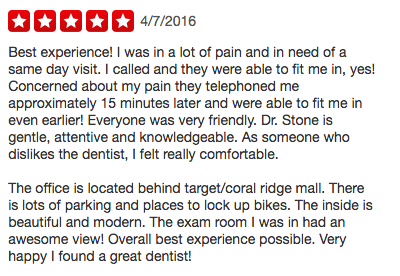 ★★★★★ Dr. Stone and his staff are wonderful! ★★★★★ What can I say, I’m just glad I found that wonderful office, thanks for being so caring. ★★★★★ Everyone there makes the visit very nice. ★★★★★ I am completely satisfied with Dr.Stone, Judy and his staff. I appreciate the fact that the office is punctual, always pleasant.and I am very pleased to be a long standing patient. ★★★★★ Great…always nice to get a cleaning and good report! ★★★★★ Getting my teeth cleaned is not one of my favorite activites, but Judy and Angie make a much nicer experience. ★★★★★ Dr Stone is undoubtedly the best dentist I have ever used. He also surrounds himself with a wonderful staff that is extremely capable and friendly. I am a snowbird and spend five months in Florida. Even if I require dental work, while on Long Island, I wait until I arrive in Fort Lauderdale. Don’t search, don’t question, just visit Dr Stone. I have been using dentists for the past 70 years and he is by far the best! ★★★★★ Great Place! I went here to take advantage of a free consultation promotion I saw on the internet and was very impressed with this place. I called on Monday and they got me an appointment first thing the next day! They were very customer oriented and gave me great advice on maintaining and improving my dental health. ! Overall, great people, great service, great place! ★★★★★ Great dentist! I highly recommend Dr. Stone to all of my family and friends. He is an excellent dentist and takes his time in making sure you are treated like the only person in his office. My fillings are not visible to the naked eye and this gives me great confidence when I smile or laugh out loud!! You will be very happy you chose Dr. Stone! ★★★★★ Fantastic Dental Specialist! Dr. John Stone has performed a lot of complex denistry on me, including tooth removal (for upcoming dental implant that he will do), easily repaired broken teeth (painless!) and has been a great resource in helping me to identify other highly qualified dental surgeons for gum and periodontists (root canal) problems that I’ve had. In fact, Dr. Stone has identified these serious problems and alerted me to having them fixed. Dr. Stone’s practice also offers bi-annual dental cleanings with their wonderful and ever pleasant hygienist. His staff is very courteous and his office is located in a very convenient commercial building (with a Chase bank underneath), right next to E. Oakland Park and US-1. I know that I can always trust in Dr. Stone, and you will see why I do! ★★★★ Top Dentist! I’ve had a lot of dental work done over the years and as a result I’ve seen more than 10 dentists. The dentist and the dental hygienist at this practice rank at the top of my list. They were very attentive to my needs and requests, I didn’t feel forced to do anything and they didn’t suggest doing any extraneous work (for some reason a common occurrence I’ve encountered in the past). They also took the time to discuss the state of my teeth and my prognosis for the future without “dumbing” it down like so many other dentists tend to do. Overall, I would definitely recommend this practice and especially Dr. Stone to anyone looking for a great dentist. ★★★★★ Good Dentist! My whole family loves Dr. Stone and his staff. We are all patients and next month my sister will be added to his list. The office is wonderful, the staff is kind and caring and the treatments are painless and fast. My sister will now drive from Boca Raton, FL to see Dr. Stone, but not to be outdone–my family and I are moving 1 hour away and will keep this dentist. With so many competing for your business, Dr. Stone has the right mix of everything. And what dentist calls in the evening after a treatment to see if everything is OK? This one does. He’s got it right and it seems as if he has been doing this for a long time! Great team. We’re patients for life. ★★★★★ Great Dentist I have gone to Dr. Stone for over 15 years and his dentistry for me has been outstanding. I first saw him, left another dentist, when I had significant gum decay. He had to do a bone transplant for me and I have not had any problems for 15 years, he saved all of my teeth, which were in danger of being lost. He’s done my crowns, cavity fillings, and all other dental services and I could not be more happy. His staff is great, still clean my teeth 3 times per year, and his staff and facilities are excellent. All of his treatments have been successful, he even stopped my snoring, which my wife greatly appreciated. I would strongly recommend him to anyone in need of a dentist in Fort Lauderdale. ★★★★★ Best Dentist Dr Stone provided me with the best service, nicest dentist and staff I’ve ever experienced. very Honest, I was Happy how Dr Stone took the time to discuss my treatment and make sure all my questions and concerns were addressed. I recommend him with confidence. You may see on the internet or in a magazine someone that claims to be “the best dentist in Fort Lauderdale”. The truth is, no dentist in the State of Florida is permitted to say he or she is better than another dentist. It is in the “rules and regulations” as adopted by the Florida Board of Dentistry and the Florida Dental Practice Act. To claim he or she is a best dentist is in violation of the dental practice act and the dentist can be sanctioned or fined. Best Dentist classification is usually bestowed on a dentist by some lay periodical, ad agency, or a group calling themselves a qualifying agency but in reality is just someone a dentist pays a fee to claim that distinction. Sometimes a third party will claim some dentist to be the best dentist in a certain area or perhaps the state, without the dentists’ permission. Unfortunately we cannot do much about that. Ethical dentists would follow the dental practice act rules.taken it upon themselves to say this. I personally have never claimed to be the best dentist. The best a dentist can do is claim that he or she does excellent care or best kind of treatment. I do claim that by virtue of my extensive post graduate training and experience that I am capable of doing the best treatment for a patient. Dr. Stone teaches Implantology, Prosthetics and Restorations, today.